Tony Carlisle has been hit by an email fraud scam claiming he has been mugged in Turkey on the eve of his wedding. A shell-shocked charity boss says he feels ‘sick to the stomach’ after being targeted by online fraudsters on the eve of his wedding. Cyber crooks hacked into the email account of Great North Dog Walk organiser Tony Carlisle and sent out a plea for cash – purporting to be from him – to over 50,000 people on his mailing list. The message claimed Mr Carlisle and partner Nicola Greenan had been mugged by a gang of thugs while on a break in Turkey and needed £1,650 urgently to sort out hotel bills. But he was back home in South Shields, preparing for his wedding day. 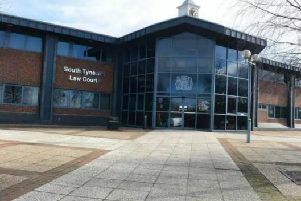 The 57-year-old, who was due to be married at South Shields Town Hall this afternoon, says his bride-to-be and mother of his three daughters has been left in tears by the scam. He is particularly concerned that the tricksters make mention of his upcoming wedding and also know the name of his partner. I feel sick to the stomach. My identity has been stolen. He is not the first charity boss in the borough to fall victim to cyber fraud. Last year, Relay for Life organiser Ann Walsh’s email was also hacked, with a plea for over 2,250 Euros sent from her account after it was alleged she was also mugged in Turkey. Mrs Walsh was inundated with concerned calls about the false message. Mr Carlisle, from Cauldwell Villas, South Shields, immediately alerted police – who are now investigating the incident. “We’re financially strapped due to the unexpected robbery attack. I’ll be indeed grateful if I can get a loan of £1,650 from you. “The police are taking it very seriously. The wedding is today and there is a worry people will send money if they think we need help. Mr Carlisle admits the online scam nearly pushed him ‘over the edge’ – coming soon after he was told by doctors that the results of a recent cancer biopsy won’t be known for another few days. After having several lesions removed from his skin at South Tyneside Hospital, he hoped to get the all-clear before tying the knot. He added: “I feel sick to the stomach. My identity has been stolen. Mr Carlisle is urging friends and charity supporters who have received the email not to send cash – and urged them to be wary of falling foul of identity fraud. A Northumbria Police spokesman said: “We can confirm that this is a fraudulent scam and would urge people not to send any money. Officers are investigating the incident.